Is it possible that Voyager is almost over? Is it possible that I started Season Seven yesterday? Is it possible that it's the middle of November and I only have a month and a half left in My Year Of Star Trek? How has this happened? The Doctor programs himself to have daydreams and adorable aliens start watching them like a daily soap opera. Hijinks ensue. This is maybe my favorite episode of Voyager. I love, love, love romps and this is one of the best Trek Romps of all. Reginald Barclay is back and he's on a mission--to make contact with Voyager. Basically, I love Barclay. You put this guy on screen and I'm in. Get him talking to holo-versions of the Voyager crew and there's no way you can pull me away from that. Basically, Gavin Park from Angel shows up on Voyager from his planet which spins way faster than the rest of the entire universe. This episode is a lesson in the finer points of fandom and inspiration. 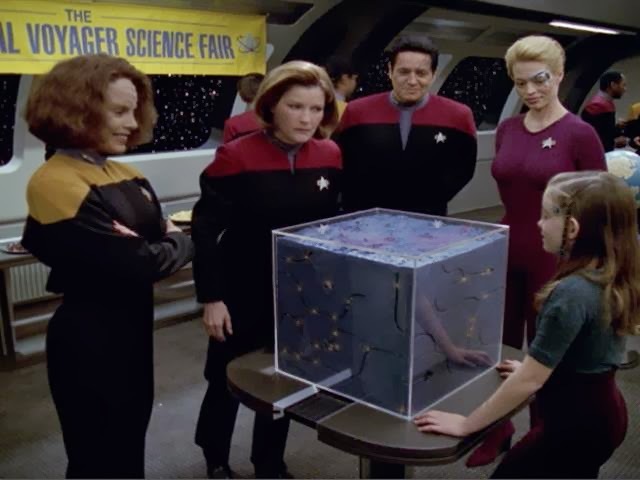 Janeway goes on a roadtrip with some of her black sheep crewmen. This one's pretty underrated and unsung but it's beautifully written and acted and it reinforces the whole "this is a family and I'm going to take care of us" Janeway perspective. I'll admit that I may be a little biased about this one for personal reasons but it doesn't matter. This is a solid episode of Star Trek and I'd put it up against just about anything else out there for its use of theme and pseudo-history to underscore the ever-present mission of Star Trek to engage and inspire. 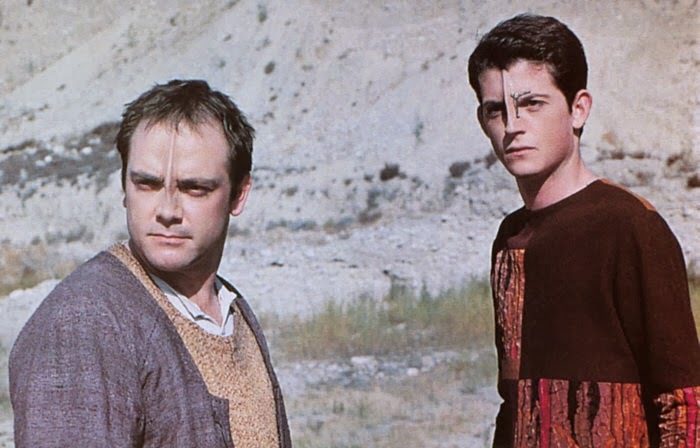 Harry, Tom, and Tuvok stumble upon a wrecked Borg cube inhabited by a number of drone children. 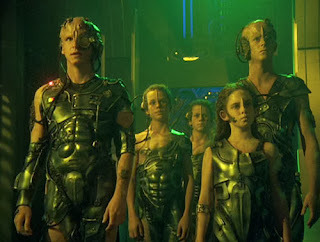 If you thought regular kids were creepy, just wait till you see these little Borg kids wandering around. The A-story in this one is all about Harry's back-from-the-dead girlfriend but the B-story is all about Seven's problem kids and it's great. Icheb, Seven's oldest kid, finds his mom and dad and everyone's eating cookies and getting excited about the reunion--except Seven-Of-Mom. Bonus Points to this one for featuring Mark Sheppard i.e. Lord of the Nerds. If you regularly read this blog, or if you only just stumbled across it, please help spread the word about it before the year is out. Let someone know about your favorite post. Heck, let me know. I like knowing you're out there. I've seen my numbers take a sudden jump lately but I'm not sure why. So, if you're enjoying this project, let me know you're out there. I'm nice--promise. Johnny! Thank you! I'm glad you're still here. I have been enjoying your blog for about a month now, and do tell my friends about it - Trek fans and potential such. I grew up with Star Trek, and was deeply invested in it as a child. I find your insights and analysis of the episodes to be highly engaging, and when you are done I have every intention of going through the shows again myself, although I haven't the time to do the whole thing, so I'll mostly be watching your "essentials." This blog has been highly enjoyable, and I really appreciate your sharing your experience with us! Thanks Matthew! I'm so glad you found the project and are enjoying it. I'm glad to hear the essentials will be helpful to you as well! I missed a couple of seasons of TNG so I'll have to go back and do those next year. (and my "missed" I mean, "didn't do essentials lists") There's plenty of info about those episodes on here but I stopped doing both essentials episodes and "weekend roundups" for a coupe of weeks.